Hi! I’m Leigh. That’s me over there in the sidebar. I’ve been sewing since March 2014 and I started this blog to chart my adventures while stumbling through teaching myself how to sew. I mainly share my finished items and talk about sewing plans and challenges like Me Made May. I get excited about fabric with animals and dinosaurs on. And then keep it in my stash because I’m too afraid to cut into it. (I’ve got two sloth fabrics I don’t know that I’ll ever cut in to.) I hate fitting and love French seams. I’m also a knit fabric convert since my manfriend’s lovely mother gave me her overlocker. You can find me hanging out on Instagram as cluelessleigh. 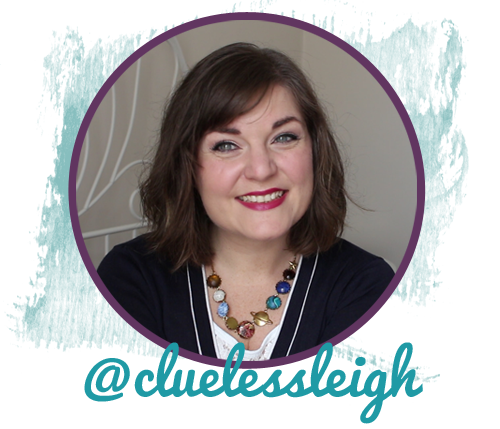 I’m cluelessleigh on Twitter – where I overuse gifs, retweet things I like (usually animals and things that make me happy or cross) and annoy the Manfriend by tweeting things he’s said that have made me laugh. I vlog about fabric hauls and sewing favourites and things like that on my Clueless Seamstress YouTube channel. And if you’d like to chat about sewing, sloths or anything in between feel free to email me. I’m trying to find a men’s shirt with a small dinosaur print on it. Can’t seem to find one anywhere in the world. I found your blog by going through google images. So, imagine a shirt made from fabric with the same or similar print to your dinosaur dress – but with a white background – so the dinosaurs are quite subtle. Have you any idea where I might find that fabric (suitable for a shirt)? So I can take it to a tailor (a place I’ve never set foot in before). Thanks very much if you can help – and if you can’t, thanks anyway! I got the fabric for my dress from http://www.myfabrics.co.uk but it’s out of stock now and was knit so it wouldn’t work for a shirt anyway. I’ve had a quick look for you on a some of the online fabric shops I use but there don’t seem to be any small scale dinosaur prints out there at the moment. The closest I could find is the centre bit of this border print: http://www.plushaddict.co.uk/lecien-nico-nico-land-dino-bouble-border.html but you’d end up needing one hell of a lot of fabric because so much is taken up by the big border part. If you don’t mind spending quite a bit there is a lot of dinosaur fabric on Spoonflower (an on demand fabric printing company based in the US) but it’s not cheap and you’d also have to pay customs fees. http://www.spoonflower.com/shop?utf8=%E2%9C%93&type=fabric&view=designs&shop=fabric&q=dinosaur&commit=Search I think there are some similar companies based in the UK but I’m not sure of their names sorry and you might have to design your own print for them. Thanks so much Leigh for the website links for dinosaur prints. I’ll have a good think about what to do. It would be fab wouldn’t it? When I have my small lottery win that is coming any day now I really want to open what I’m calling a Habercafery selling fabric and cake. There’s a shop in Swansea I visited for the first time the other day – soooo much fabric it was a bit daunting! And dude, you’ve made far more impressive things than me! You’ve done a fancy shirt collar and a lined coat. I’m planning a lined Pavot soon, how did that go? I would like to personally congratulate you as your blog Clueless Seamstress has been selected by our panelist as one of the Top 100 Dressmaking Blogs on the web. Oh that’s lovely news. Thank you. Hello Leigh how are you? I hope that the reason you’re not vloging is because you are so busy living life and enjoying yourself? I do miss your bubbly personality and happy face. I really do hope that you are well. Hope to see you on Utube very soon?